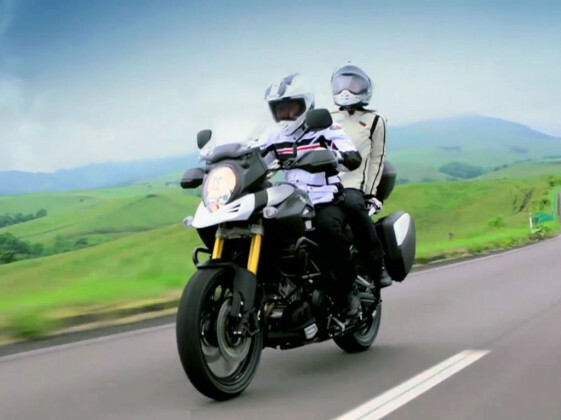   ADV Bikes  2014 V-Strom 1000 – Best Adventure Bike Value? 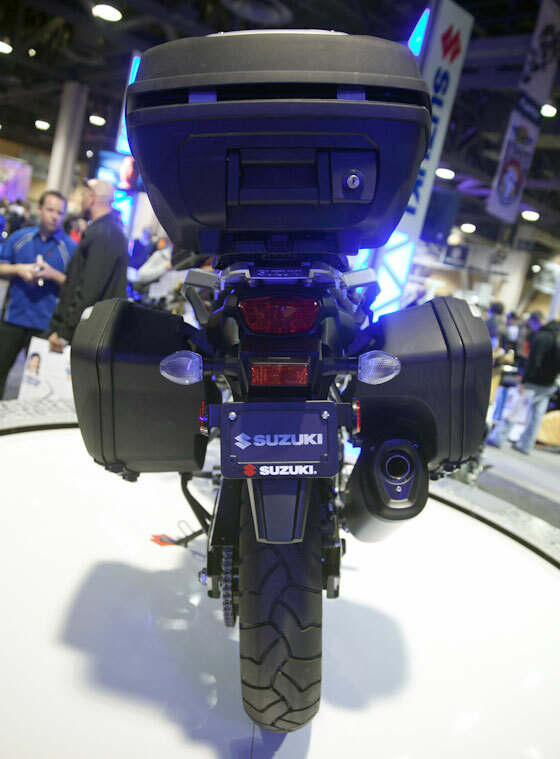 Suzuki has received a lot of praise after the announcement of their 2014 V-Strom 1000. With its attractive styling and reasonable price, the bike has generated a lot of excitement in the industry. The positive reception of the new model release was definitely encouraging news for Suzuki, after several years of struggling financially. Originally released in 2002, the V-Strom 1000 was long overdue for an overhaul. Suzuki invested significant resources to ensure their new V-Strom 1000 would be a sales success. The bike was designed to hit a sweet spot of power, weight and price, making it the best value in the Adventure Touring Segment. Several motorcycle publications have now completed tests of the machine and opinions have been formed. Is the 2014 V-Strom 1000 the best value in Adventure Motorcycles? Here is a summary of what reviewers are saying. Attractive Styling: The first thing you notice about the new V-Strom 1000 is that it looks nothing like the old V-Strom 1000. The old V-Strom had a “Plain Jane” appearance and hardly looked like an Adventure Bike. The new V-Strom has a more chiseled adventure look. Although the front beak of the V-Strom has received mixed reviews, most agree that the styling is much improved. Smooth Power: Suzuki engineers have increased the size of the engine from 996cc to 1037cc and tuned the motor to produce more Torque at a lower rpm. Power has been increased by only 2 hp over the previous model (97 hp vs. 99 hp), but Torque is maximized in the low to mid rpm range (76 lb.-ft. @ 4,000 rpm vs 74 lb.-ft. @ 6,400 rpm) The new motor may not be a screamer, but power is always adequate and accessible up to 8,000 rpm. Hi-Performance Brakes: The new radial-mount Tokico monoblock front-brake system is borrowed from the GSX-R line, so braking power is significantly improved. The 2014 V-Strom 1000 also comes standard with ABS. Improved Gas Mileage: The new engine has boosted fuel economy by 16% according to Suzuki. This improved efficiency allowed Suzuki engineers to decrease weight and bulk with a smaller gas tank while maintaining the same range. Integrated Luggage: Suzuki engineers designed an optional storage system that includes panniers and top box. Panniers fit snugly to the bike at a width less than the handlebars to maintain good maneuverability. All locks for the luggage are keyed for the ignition key by the dealer. Better Handling: The 2014 V-Strom has a longer wheelbase for better high speed stability. Suspension improvements and weight reduction provide sportier handling on the twisty back roads than the previous model. An upright riding position and wide handlebar give excellent control and confidence on any surface. Less Weight and Bulk: The V-Strom 1000 is now one of the lightest liter class bikes available. After a 25 pound weight reduction, the V-Strom is now close in weight to the more pricey Ducati Multistrada and KTM 1190 Adventure. Reviewers claim the new V-Strom 1000 feels close in size and weight to the V-Strom 650. Effective Traction Control: Suzuki offers traction control as standard equipment on the 2014 V-Strom 1000. The new system keeps operation simple with three modes. The three modes equate to Performance, Standard and Off. The new systems is reported to be easy to use and effective. Easy Adjust Windscreen: The windscreen can be adjusted by hand to redirect wind flow at different angles. The new system uses a ratcheting mechanism for easy operation while riding. The height can also be adjusted with tools. Large Accessory Catalog: Suzuki has produced an extensive line of add-on products for customizing the new V-Strom. 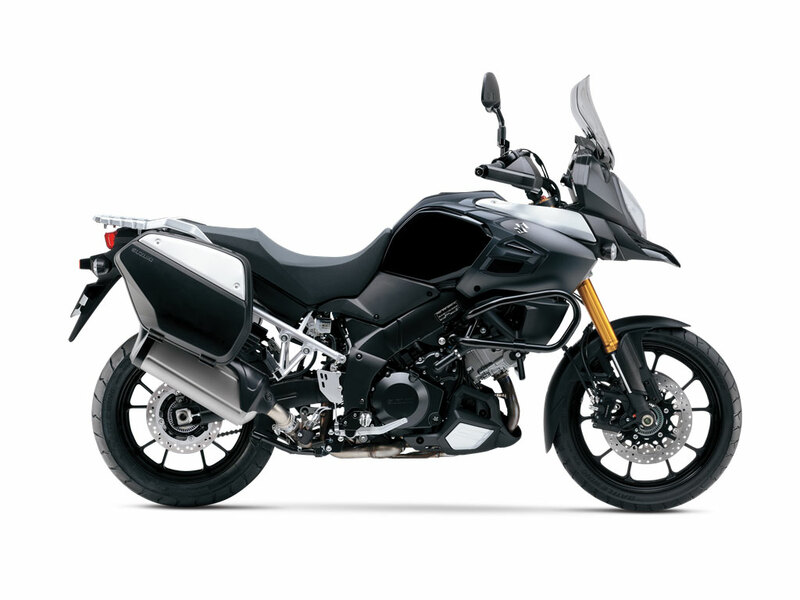 The V-Strom 1000 “Adventure” will package together many popular accessories like the touring windscreen, hand guards, panniers and crash bars, at a bargain price. The V-Strom 1000 Adventure includes popular accessory options at a discount. Always On ABS: There is no way to switch the ABS off for off-road riding unless you remove a fuse manually. 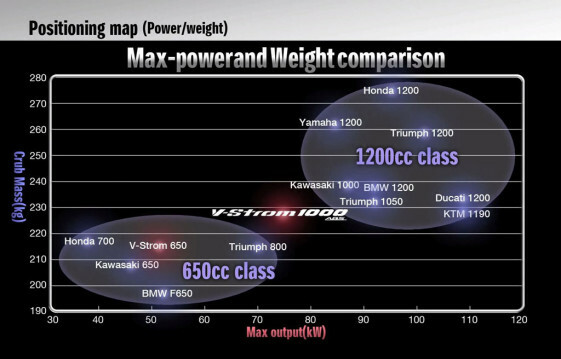 No Top-End Power: Max horsepower is achieved at 8,000 RPM but the bike feels flat after 6,000 RPM. Short-shifting provides the best acceleration. Cornering Ground Clearance: The long footpeg feelers and the low muffler will begin to touch pavement early during aggressive cornering. Excessive Crash Damage: During an off-road test, several journalists fell in the dirt. The damage was excessive for a small tip over. Exposed Underbelly: The V-Strom has low ground clearance (6.5 inches) for an Adventure Bike. Both the exhaust header and oil filter are precariously exposed under the bike. The factory protective skid plate would be a smart purchase for anyone considering travel off-road. Lacks Off-Road Intent: The V-Strom was clearly not meant to be a serious off-road tool with only 6.3 inches of suspension travel. However, its low weight and quality suspension should allow it to explore maintained dirt roads confidently. Wind Protection: Some reviewers complained that the standard windscreen did not provide enough coverage from the wind, even when adjusted to the highest position. A larger touring windscreen is available through the options catalog that provides more wind protection. Who will buy the 2014 V-Strom 1000? The most likely customer for the new V-Strom will be owners of the old V-Strom, looking to upgrade their bikes. The V-Strom buyers are looking for good value for their money. They want a bike that is easy to operate and fun to ride. They appreciate the low weight and low seat height that make the bike less intimidating to handle. Comfort, fuel efficiency and safety features like ABS and traction control will be valued more highly than performance capabilities. Most will find the performance of the bike more than adequate to meet their needs. New V-Strom purchasers want a Japanese motorcycle with an affordable price tag and low cost of maintenance. They appreciate Suzuki’s vast dealer network and easy financing. The V-Strom is not meant to be a shiny trophy bike that will spend most of its life in a garage. V-Strom buyers will use the bike for their daily urban commute and weekend touring of back roads. They will also want to have the option to explore the occasional dirt road (with caution). Overall, the 2014 V-Strom 1000 will do everything its target market asks of it, at an affordable price. How does the V-Strom compare to other Adventure Bikes? This Suzuki chart shows their focus on the center of the Adventure Touring Market. The biggest competition for the New Suzuki V-Strom is the Old V-Strom. The new V-Strom fills the same spot in the market as the previous model, but now has solidified its position with improvements in nearly every category. The closest competing Japanese models are the Yamaha Super Ténéré 1200 or Kawasaki Versys 1000 (non-U.S. model). The Suzuki has the advantage of lower weight over these two Japanese competitors. However, the Versys 1000 does offer a lower price if you can get one in your country. For those looking for a less intimidating Adventure Bike, the closest competing models are the Triumph Tiger 800 or BMW F800GS. The Suzuki has a power advantage over these European competitors, as well as a lower cost of maintenance. A great looking, well balanced, light weight “Real World” Sporty Adventure-Style bike with great low RPM power . . . Just what I have been waiting for! I own a 2010 with staintune pipes. So for me,Twin pipes would look so mutch better than that ugly box.